At one time Crested Butte was famous for its rich coal seams, but today the Colorado town is all about skiing, biking, and the beauty of its wildflowers. 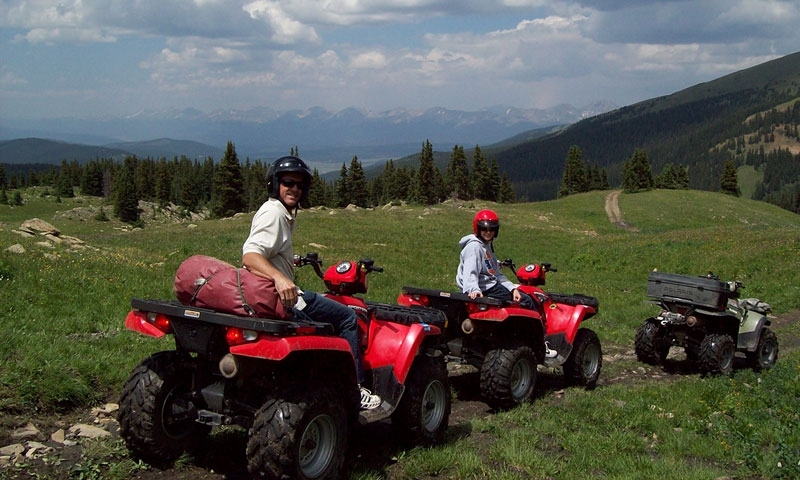 Crested Butte is widely known as one of America's top skiing destinations, but in the summer, it is just as packed with incredible outdoor activities. Crested Butte is reputed to be the place where mountain biking got its start, and to this day it is one of the top destination for mountain bikers. Check in with the Crested Butte Mountain Bike Association for full maps of the hundreds of trails in the area. Every June, Crested Butte also plays host to the country's oldest bike festival, Crested Butte Bike Week. Thousands of bike enthusiasts from around the world come to compete, play and hit the expert 401 trail in Gunnison Valley, which is just outside of town. While you're there you might want to check out the Mountain Bike Hall of Fame. If you're hoping to spend some time fishing in Crested Butte, you have to go fly fishing. Dragonfly Anglers can arrange for walk-wade trips or float trips, where a guide will take you for a half day or full day of some of the most beautiful fly fishing in America. They're also able to customize your trip for whatever level of fishing you are comfortable with, from first-timers to experts. Every summer, Crested Butte plays host to the month-long Crested Butte Music Festival, which runs from July into early August. The music festival covers a wide variety of genres, and features highlight weekends as eclectic as Bluegrass in Paradise, Gypsy Jazz in Paradise and Opera in Paradise. Crested Butte is officially the Wildflower Capital of Colorado, and every July the town celebrates all that natural beauty. The Crested Butte Wildflower Festival is a week of workshops, tours and information sessions about flowers, teaching you how to paint them, photograph them, plant them, and even cook with them. Why not plan to explore the surrounding mountains from horseback? There are full-day and half-day guided rides available. If you prefer a motorized way of soaking in the views, Crystal River Jeep Tours take you up the gorgeous Lead King Basin Loop, where you can see the best wildflowers, and around the fascinating Devil's Punchbowl. Crystal River can also arrange for pick up and drop off if you want to spend some time deep in the mountains taking pictures or painting. In August, the Crested Butte Arts Festival draws more than 10,000 people to celebrate the best of performing arts, culinary arts and visual arts. This is a varied and fun festival, featuring everything from a live demonstration from one of America's top chefs, to art lessons for the kids, to a high-end art auction. Just because it's summer doesn't mean you should avoid the world-famous Crested Butte Mountain Resort. In the summer, the resort's Adventure Park lets you climb, golf, bounce and tube. The tubing runs on Warming House Hill are the most fun, with a great tow to bring you back to the top. You can also ride either the Silver Queen lift or the Red Lady Express to the top of the mountain, whether to enjoy a picnic, take a great hike, hit an incredible mountain bike trail, or just take in the incredible view before riding the lift back down. Crested Butte Mountain Resort also has one of the best disc golf courses in Colorado. It has 18 holes, and is a lot of fun for families, golfers, outdoors types, and, well, everyone. If you prefer to play the golf "old school," the Robert Trent Jones II Championship Golf Course at the Crested Butte Mountain Resort has been described as one of the best golf courses in the country. If you're an expert kayaker, head to Gunnison and Crested Butte for some of the fastest water and incredible waterfall drops, which are called Oh-Be-Joyful, Little Daisy, and the Black Canyon of the Gunnison. Even if you are not an expert, there are stretches of river suitable for all levels of rafting, kayaking and even whitewater canoeing. Both Scenic River Tours Inc. and Wilderness Aware Rafting can arrange for a variety of trips, from a two-hour trip to a full day of rafting down the Gunnison or Taylor Rivers. Just as summer comes to a close, Crested Butte celebrates the change of season with the Fall Festival of Beers and Chili Cookoff held right at the bottom of Crested Butte Mountain. Attendees can warm up with samples of great homemade chili and cool down with beers from over 20 local breweries, all while enjoying live music played all afternoon. There are few better ways to end the summer than with good beer, good chili and the sweet sounds of live music lilting through the summer mountain air. About HomeAway.com: HomeAway Network provides vacation rentals all across the world. Check out their selection of Crested Butte lodging as well as other places in Southeastern Colorado such as Telluride, Pagosa Springs, Ouray and Durango rentals and other lodging locations. Author, Kiley works and writes from Denver and has been editing and writing travel articles for the past five years. She and her husband have three kids, proudly call themselves “Colorado Natives” and love road trips exploring the Rocky Mountains and the West. For additional travel resources about Colorado visit HomeAway's Colorado Travel and Vacation Rentals Info for more great tips from Kiley.